Eswatini (Swazi: eSwatini [ɛswa̯ˈtiːni]), officially the Kingdom of Eswatini (Swazi: Umbuso weSwatini) and also known as Swaziland (/ˈswɑːzɪlænd, -lənd/), is a landlocked country in Southern Africa. 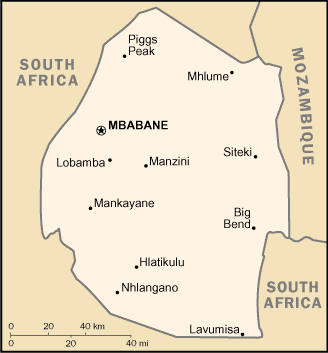 It is bordered by Mozambique to its northeast and South Africa to its north, west and south. The country and the Swazi people take their names from Mswati II, the 19th-century king under whose rule Swazi territory was expanded and unified.